Discussing environmental issues can be a pivotal part of a student’s environmental education. Thinking about complex issues while engaging in respectful discussion is an opportunity for students to develop skills that are important throughout life. In this activity, students discuss the question, “Should humans stop wildfires?” At first, students typically respond, “Yes! Fires are bad!” In reality, fire management is a challenging environmental management problem, and the question has no simple answer. To make actual fire policy decisions you need a thorough analysis of the impacts of fires—which are not all bad!—on different ecosystems. You also need to think about the usefulness, cost, and effects of different management approaches and solutions. 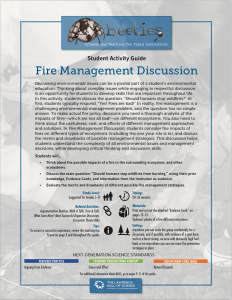 In Fire Management Discussion, students consider the impacts of fires on different types of ecosystems (including the one your site is in), and discuss the merits and drawbacks of possible management strategies. This discussion helps students understand the complexity of all environmental issues and management decisions, while developing critical thinking and discussion skills. Think about the possible impacts of a fire in the surrounding ecosystem, and other ecosystems. Discuss the main question: “Should humans stop wildfires from burning,” using their prior knowledge, Evidence Cards, and information from the instructor as evidence. Evaluate the merits and drawbacks of different possible fire management strategies.